Fuel cell cars drive! 3 of them, Mercedes B-class F-Cell, have just been all around the world, driving a total 56,000-mile. 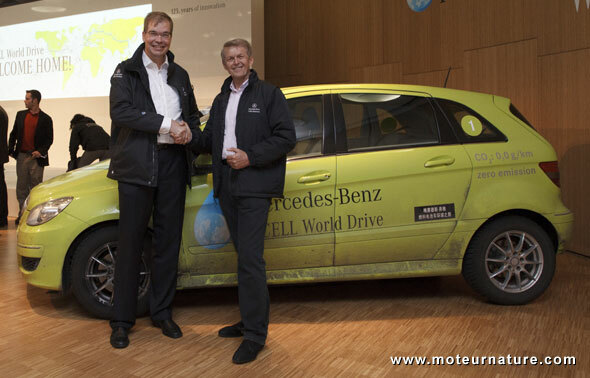 Back in Stuttgart at the Daimler group headquarters, Linde, the giant gas and engineering company, was celebrating with Mercedes, as it had been the hydrogen provider for the whole duration of the trip, all around the planet. The Daimler group has thus proven that its fuel cell cars are reliable, while Linde has shown that it can provide hydrogen everywhere. Their partnership has been so good that the 2 companies will keep on working together, building a network of hydrogen stations in Germany. They have already agreed to build 20 filling stations, in the 3 cities of Stuttgart, Hamburg and Berlin, and on the highways between them. Of course, 20-stations don’t sound like much, but I believe it’s a good start. And I like the fact that Mercedes will invest some of its own money in building those stations. It’s a proof that the company is serious about fuel cell cars, and that it intends to make them available to the general public. At least in Germany.